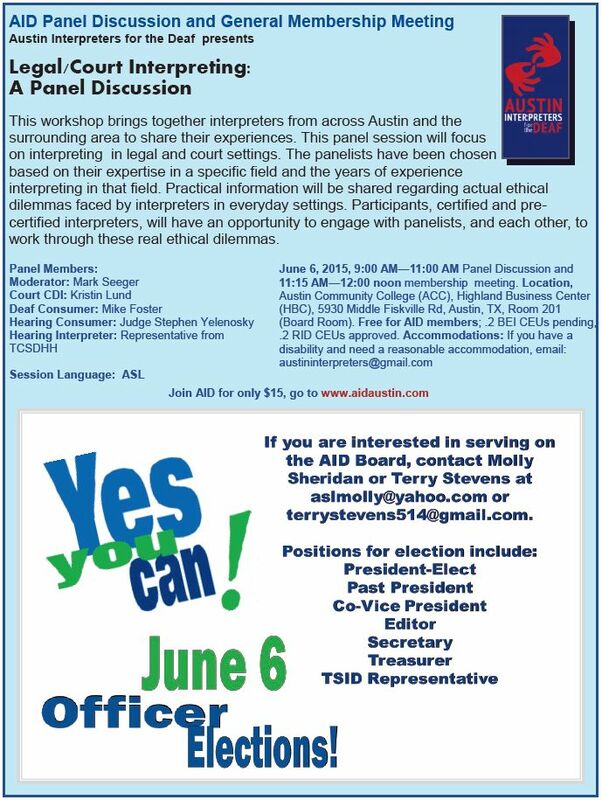 This workshop brings together interpreters from across Austin and the surrounding area to share their experiences. This panel session will focus on interpreting in legal and court settings. The panelists have been chosen based on their expertise in a specific field and the years of experience interpreting in that field. Practical information will be shared regarding actual ethical dilemmas faced by interpreters in everyday settings. Participants, certified and pre-certified interpreters, will have an opportunity to engage with panelists, and each other, to work through these real ethical dilemmas. TIME: 9:00 AM—11:00 AM Panel Discussion and 11:15 AM—12:00 noon membership meeting. Location, Austin Community College (ACC), Highland Business Center (HBC), 5930 Middle Fiskville Rd, Austin, TX, Room 201 (Board Room).